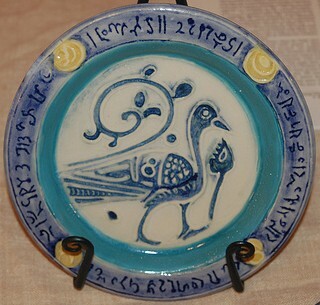 The origin of laqabi pottery (also known as Kashanware) is debated, but most historians believe the technique started in Egypt, then moved with the potters to Syria and finally made its home in the northern part of Iran in Raqqa, where it was produced for a short time during the later part of the 12th century. (Metropolitan Museum). It was usually decorated with a large bird, animal or human figure in the center of the piece surrounded by a decorative border. (Metropolitan Museum) The colors most favored were blue, green and purple. (discoverislamicart). First, the body material was not a naturally dug clay. The body, known as fritware, was a composite made up of ten parts of quartz, one part of glass, and only one part of fine white clay. This recipe is from the 1301 treatise by Aba’l-Qusim of Kashan. (Ashmolean Museum) This mixture resulted in a hard white ware, similar to Chinese porcelain. Because I did not have technical information available to me about firing temperatures and ancient glaze recipes, I chose modern materials to duplicate the technique and final results. The colorants would be the same as was used in modern alkaline glazes suggesting cobalt oxide for blue, copper oxide for green, and manganese dioxide for purple. 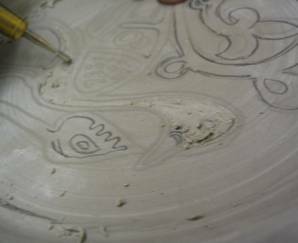 A white, medium firing clay, similar to a fine porcelain, was thrown in a shallow bowl form. The piece was allowed to dry to a leather-hard stage, that is, firm enough to be handled without distortion, yet soft enough to be carved easily. The background around the main design, in this instance a peacock, was carved out, as were the details in the design itself to form the “dams” that would later keep the colors from flowing together. Because I was unable to find any information about how the base of this particular piece was finished, I footed it as other pieces of the same period would have been finished. 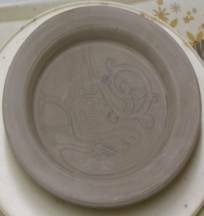 When the piece was completely dry, it was fired to the bisque stage. 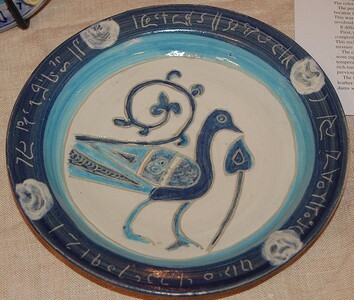 The design was then painted in using under-glazes and colored glazes. 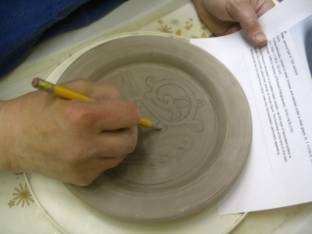 The piece was fired a second time to a higher temperature to melt and bond the glaze to the plate, and to vitrify the clay. Next time I would start the piece sooner because of all the variables involved in duplicating comparable colours. 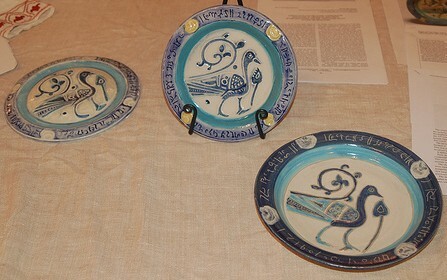 Two Trial Plates, an the final plate. 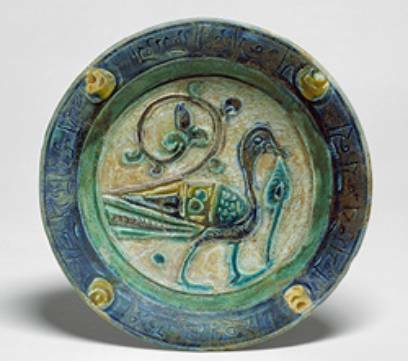 Jenkins, Marilyn, “Islamic Pottery: A Brief History,” The Metropolitan Museum of Art Bulletin, New Series, (Spring, 1983), Vol. 40, No. 4, pp. 1-52. Welch, Stuart Cary, et al. “Islamic Art,” Notable Acquisitions (Metropolitan Museum of Art), No. 1979/1980. (1979 - 1980), pp. 16-19. Mason, Robert B., “New Looks at Old Pots: Results of Recent Multidisciplinary Studies of Glazed Ceramics From the Islamic World”, Muqarnas, (1995), vol. 12, pp 1-10.